From the Baldwin County Courthouse, go west on Hancock Street for 2 blocks or 0.2 mile (or the one large block containing Georgia College & State Univ.). Turn right on Clarke Street. Go one large block or 0.2 mile. Turn left onto Highway No. 22 west (Montgomery St.). Go 7.8 miles. Turn right on Lawrence Rd. Continue on Lawrence Rd. past the Pleasant Grove Church on the left. One half (1/2) mile past the church is an intersection (crossroads) of Nelson Road. At this intersection and across Nelson Road, is a lane on the left which parallels Lawrence Rd. This lane leads to the site of the old Horne home. Go down the lane. Currently there are two forks off the lane to the right. Take the second fork and walk 100 feet. Take the path to the left for about 100' that leads to the cemetery. 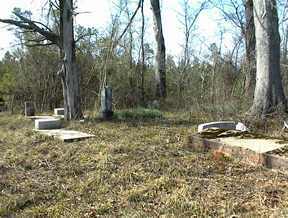 The cemetery is in a small clearing among some very large hardwood trees. Also of interest. Do not take the fork. Continue toward the old home site. About one block (1/4 mile) before reaching the old home site, there were two old hickory trees (stumps or dead trees are all that remain). Between these hickory trees may have been a gate or entrance to the cemetery. 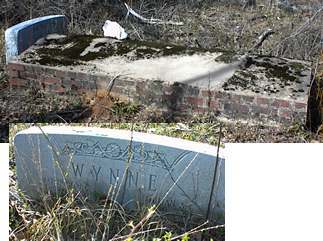 The cemetery is located about one city block from this entrance from the lane, off to the right of the lane. It is not visible from the lane. Total distance of the cemetery from the intersection of Nelson and Lawrence is 0.39 mile bearing 219 degrees. w/o A.I. Horne; d/o T.J. Howard and Elmira Churchill. "Rest in peace nature's noble woman." b. Canton, IL, per family bible. Left 5 daughters, the youngest being 3 days. s/o Thomas B. Horne First name per editors. "Father" h/o Laura Ophelia Miller, per editors. Middle name per editors. No marker but possibly buried here. No marker but buried here per family bible. Possibly 2 or 3 more unidentified graves. 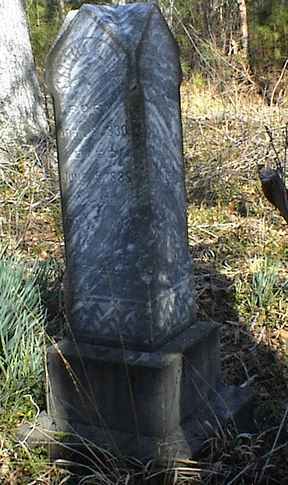 A marker placed by Mrs. Roland Lawrence showing the location of 14 slaves buried under large tree that came from the original Virginia home of Mr. Thomas Horne's wife.